It’s almost too easy to talk about how good Portal 2 is. All you have to do is pick out any one single thing about it and suffix it with ‘is awesome’. Or, if you wanted to go a different route, you could just spew out some of the hilarious lines and gags that help make it so enjoyable. See? Like that. It’s awesome. 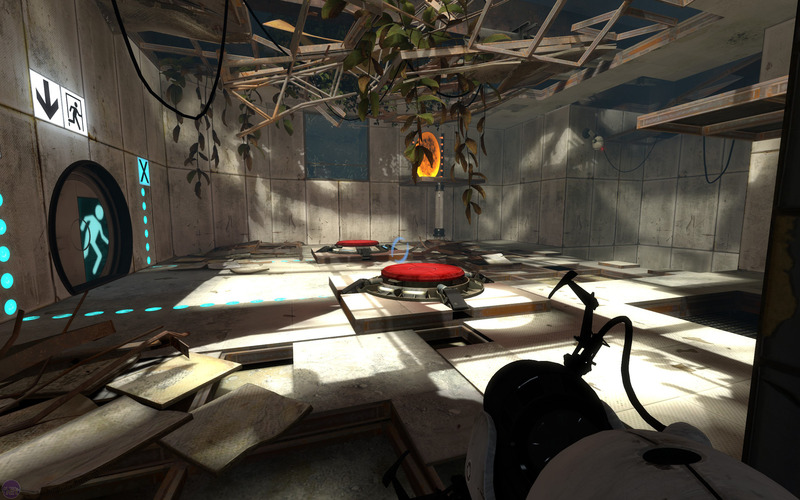 Portal 2 is awesome. Not perfect, admittedly, but always with the level of thoughtfulness and elegance that we’ve come to associate with Valve. There are few other studios which could, with so little apparent effort, sculpt an introductory sequence that so quickly gets players caught up on the complex plot and game mechanics, while also delivering action and humour. That’s exactly what Valve has done with the opening to Portal 2, however. One minute you’re waking up in a hotel room which is clearly not what it seems, the next you’re going to sleep and waking up again eons later. A bumbling robot gives you the summary of the situation while simultaneously poking fun at your character's muteness, then it’s straight down to the issue of escape. This all takes place in the opening minute of the game. That may not seem immediately significant, but it’s worth pausing to admire the subtlety of the delivery. Where other games would ram FMVs down your throat or walk you through over-expansive tutorials, Portal 2 just gets right down to business. The whole affair is simply, slickly and skilfully handled. It’s just a taster of what’s to come, too. As you fly through the early levels, which lead you through familiar experiment chambers reminiscent of the original game, there’s a real feeling that Valve is just stretching its legs. Sure enough, when evil AI GlaDOS returns to bully you some more at the end of the first section, the pace suddenly increases. Before long you’re sprinting through a world rich in laughs and brainteasers. Stephen Merchant, who plays babbling CPU core Wheatley, is an excellent antidote to some of the first, harder puzzles. The real star is neither the script nor the levels, however; it’s the technology that drives the game. Valve’s Source Engine may be getting on a bit now, having debuted back in 2004, but the constant upgrades since then mean it still looks as good as the competition – especially when dealing with such an iconic and visually striking world as Portal’s. The familiar halls of Aperture Science’s secret laboratory offer an entirely different ambience to your first visit, with the clean white panels now cracked and crumbled by weeds and wear. As Merchant’s Wheatley explains in the opening sequence; you’ve been asleep a long, long time. There’s lots to do now you’re awake. First up: Science. Evolve is a fantastic concept in search of a game to support it.